You guys were on fire yesterday. Was talking to a few others and I think we should come and check out Turners Camp next big northerly. Yeah, that was a lot of km from you yesterday Pete, well done your fitness has well and truly returned. 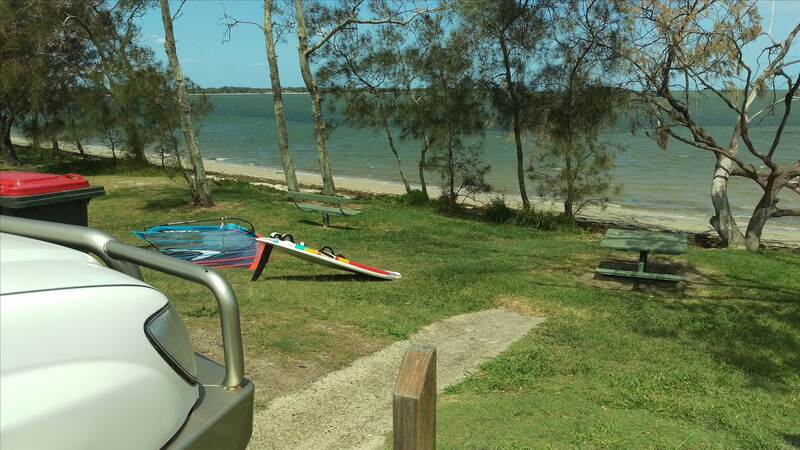 John and I just whizzed around inside the sand bank but Adam and JV have discovered that they can do a big bear away up Ningi Creek, that's where they hit their speed with a bit of extra length. It started out a bit gloomy, but the wind blew the cloud away and it was stunning at Sandstone today. Jeff couldn't resist a quick sail before arvo shift and The Pope was settled in for the tide. Bit bumpy early with gusty winds but it got better as the tide dropped. I was right on the edge of being under powered with a 7.5 but it was a fun bit of sailing with Sandstone as nice as it gets. Will the boss let you play Paddles??? Sunday was a little ordinary for sailing so I gave it a miss and did my chores to keep mummy happy, today however was frikkin lovely. I joined Johnny B and BJ for the high tide. 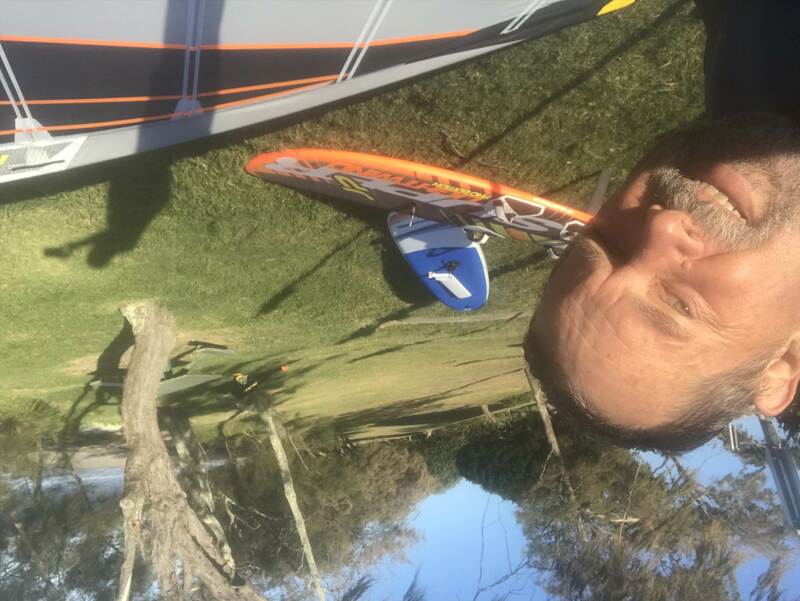 Little bit up and down with it dipping below 15 for a bit which had me slogging on the Magic with a 7.5m sail so I rigged a 9m sail and went out on the GO for a bit till I got a bit overpowered and went back to the Magic. BJ reckons he hasn't sailed for 8 years, but he was bloody flying so I'd hate to see how quick he would have been 8 years ago. 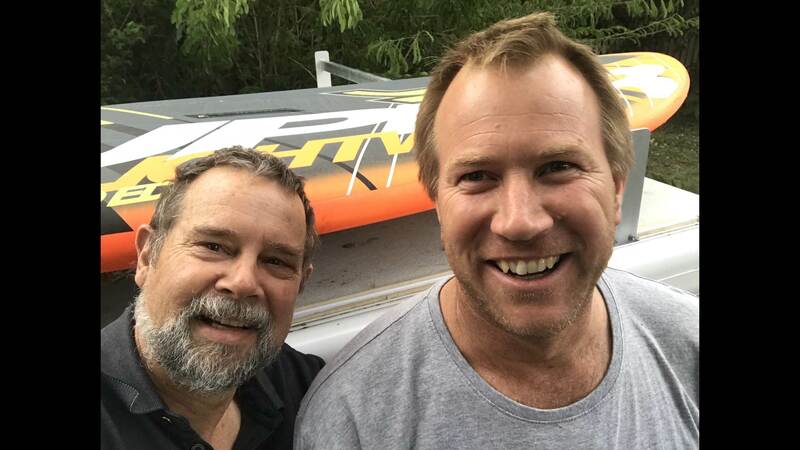 Adam and Jeff dropped in late for the very last of the tide with Jeff taking the "sensible" option of using an 8.6m, twin cam race sail with his new LT, he was flying across the sand flats on it. Thanks guys for all the local knowledge, was a great day testing out the new board (isonic 107) and all my old gear, only damage done was 2 rips in the Mylar of my ancient NP Z1 7.0m, and my whole body from head to toe, might of even taken some pain killers for the trip home, lessons learnt, don't leave it so long between sails, as they say use it or lose it, will be back again for sure, cheers guys. Snip.....Jeff dropped in late for the very last of the tide with Jeff taking the "sensible" option of using an 8.6m, twin cam race sail with his new LT, he was flying across the sand flats on it. had trouble sacrificing sleep after night shift .... kept thinking wind is blowing GET OUT OF BED!!!! took 2 of my lightwind toys. The Wally lt and jpslw. 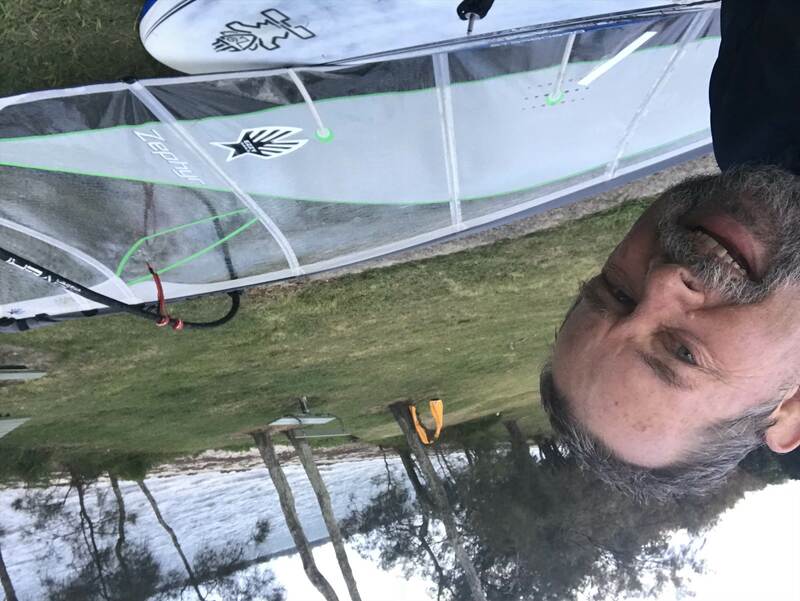 Decided maybe enough water for the slw however the tide disappeared rapidly and so it was to be the 8.5 naish and the longboard. after an hour of powered up cruising gybes a small squall came through and took the wind away. Found it then difficult to stay balanced doing minimal wind gybes .... I'm such a klutz with balance!!! Day 2 - 20-25 conditions but a bit up and down and gusty at times. Johnny B sailed early in the making tide and got bashed around because it was really rough so he had a breather while I rigged up. I got there once the tide had turned and sailed until I started to hit the bottom. 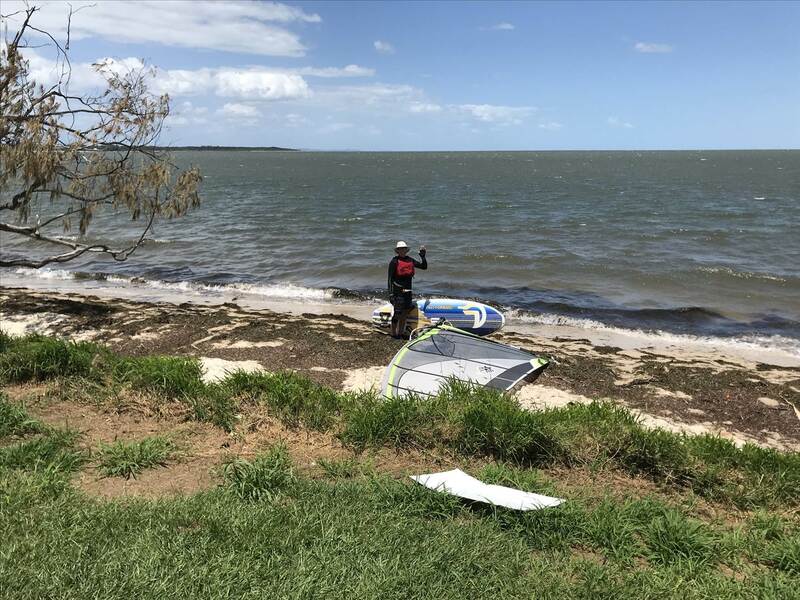 The water flattened of heaps as the tide dropped and I went home while John had changed to his delta fin and kept sailing in really flat, shallow water. The bay was completely white from whitecaps when I left. Day 3 - 18-20 knot conditions with a lot of East in the wind, this makes Sandstone as good as it gets on an outgoing tide. Only a very small chop right out the back and just ripples in close with clean water and slight overcast. Enough wind to get away with 6.5m sails with only an occasional hole in the wind. JV Jonno and The Pope were into it as well. Today was the best sailing conditions I've ever had at Sandstone, even the Pope called it as "perfect". Big shout out to my mate Tony for helping me get roofracks on the little van - really appreciate the help. getting prepped to make a few trips down south over school hols so max can sail in some regattas..... Dad may get the odd sail in himself!! Will you be at Sandstone tomorrow? I reckon i got one you can have muzz, pm your number. Anyone thinking of a high tide sail at Turner's tomorrow if the weather isn't too silly? Who is up for a friday arvo sail at turners to cool off? 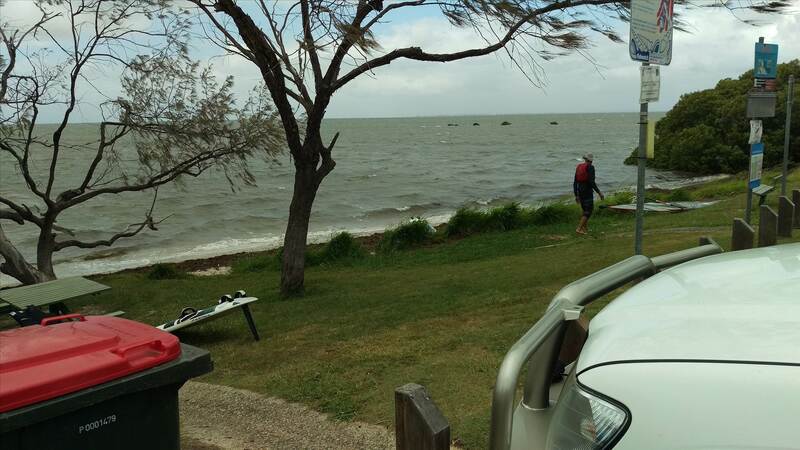 We just went over to Bribie for Chinese and it's frikkin howling out there, there's waves breaking in the passage. Big late morning tide tomorrow so see you kids at Sandstone, it should be good fun. Very enjoyable day with a few of us at Sandstone this morning, nice to catch up with Pete at his old stomping ground too. 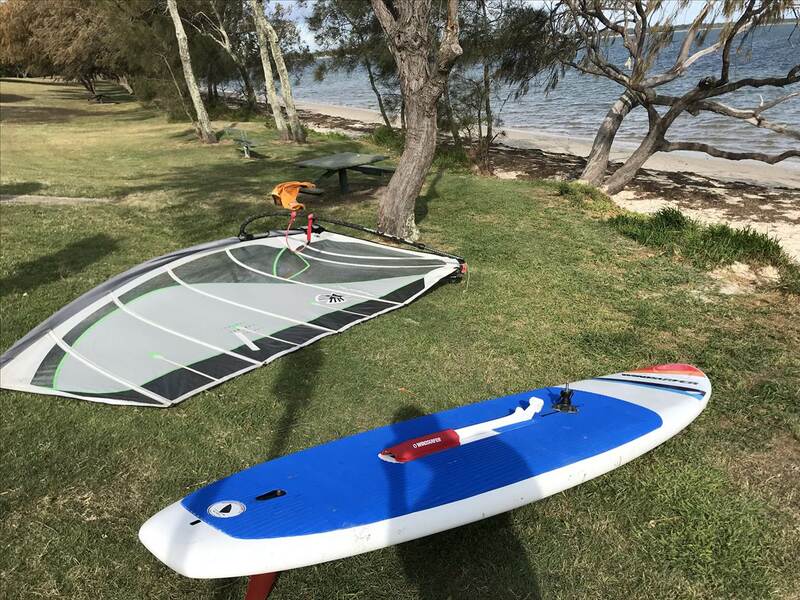 The wind was a little bit gusty and up and down at first so I started with a 5.3 wave sail and then ended up with the 6.5 which seemed to be most people's choice. Pretty bumpy at first on the rising tide which was heap of fun but beat me up a bit for when it flattened out on the falling tide. Big tides too so the water disappears very quick. Interesting to see whether it hangs in for tomorrow.